At some point in your life, you’ve probably tried a sauna, whether it was wood-burning, steam or infrared. A sweat session is a great way to relax or bring relief to achy, sore muscles. At traditional saunas, however, you might be stuck sweating in a room full of strangers. They could be overly chatty, too close for comfort, or worse. The air can be too humid or too hot, and you can leave feeling drained rather than rejuvenated! Where can you go to unwind in peace, and leave feeling refreshed? The Sauna Room is a sanctuary nestled inside of Dwell Yoga in the new Avon @Legacy Commerce Park at 4645 Avon Dr #190A in West Frisco. Owner Shannon Slack, a firm believer in the benefits of infrared wellness, created a space that features infrared heat in a beautiful and serene environment where you can enjoy a sweat session in a private room. Move over steam and hello infrared! Are you wondering what the difference is between a traditional sauna and an infrared sauna? Infrared light is the invisible part of the sun’s spectrum. It has the ability to penetrate human tissue, which produces an abundance of health benefits. The infrared sauna uses this light to create heat, which increases the body’s core temperature, thus resulting in a much deeper, more detoxifying sweat from the cellular level of the skin where many toxins reside. I recently had the privilege of sweating at The Sauna Room and loved my experience! The infrared sauna appealed to me because you have the ability to control your heat temperature – unlike a traditional steam sauna room where the temperature gradually elevates to between 150 to 180 degrees Fahrenheit. For some, those temperatures can feel a bit extreme. The Sauna Room preheats the space to 100 degrees Fahrenheit prior to each session, and each client can adjust the temperature as needed. Shannon says the optimal sauna experience occurs between 100 and 130 degrees Fahrenheit. 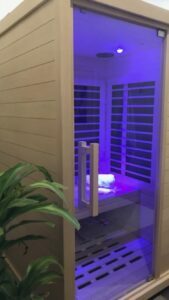 The Sauna Room also offers Chromatherapy, or color therapy, in 15 different hues. This is a form of therapy that offers light and color to alter your mood. After a typical crazy morning of getting the kids off to school, followed by a run, I opted to utilize blue light during my sauna session. I needed a sense of calm and peacefulness. Plus, blue, violet and indigo light therapy are supposed to be good for the nerves and brain. If Chromatherapy isn’t your thing go ‘sans’ lights and simply enjoy the dimly lit environment! Consider starting with a detox session of 10-15 minutes every other day for your body to build a tolerance to infrared therapy. Gradually increase your sessions to 25-30 minutes. Over time you’ll build up to a 40-minute daily session in the optimal temperature range. Depending on your wellness goals, The Sauna Room recommends sweating 2 to 3 times a week to reap maximum health benefits. To maximize your infrared sauna experience, consider these tips. Bulk up on your fiber intake prior to a sauna session. Many toxins are secreted out via sweat, but the ones that aren’t, go into the digestive system. In essence, the toxins are reabsorbed back into the body and fat cells. Adding extra fiber to your diet an hour before you sweat (or after) allows for maximum detox benefits. Hydration is also key to your sauna room experience! Drink 16 – 20 ounces of water prior to your sweat session. Hydrate while you sweat especially if you’re sensitive to heat. Replenish your body with 8 – 16 ounces of water post-sauna as well. Remember, your body consists of 50-75% of water, so what you sweat must be replenished! It’s best to bathe prior to utilizing the sauna to remove any unwanted residue from your body (e.g. lotion, oils, and air pollution). This helps to stimulate the body’s circulation and will create a quicker and heavier sweat. What to wear? In the case of an infrared sauna, less is more. You want to wear as little clothes as possible to allow the body to be in direct contact with the infrared light waves in order to penetrate the skin. I opted for a sports bra and underwear only to allow the light waves to penetrate as much of my body as possible. If you haven’t had the luxury to sweat at The Sauna Room yet, consider their $20 introductory sweat offered to first time users. It’s a steal of a deal! Take a pause, Frisco, and sweat your way to a healthier you. Health Tip: Like any good thing in life, always listen to your body and beware of excessive detoxifying. If you have any type of health issues consult your doctor first. If you’re pregnant, avoid the sauna until after you have had your baby because toxins can be released to the fetus.